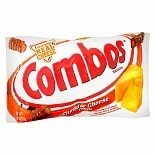 Shop Combos Cheddar Cheese Pretzel (6.3 oz. )6.3 oz. 2 for 4 dollars and 00 cents or 1 for 2 dollars and 49 cents 2/$4.00 or 1/$2.49$0.40 / oz. 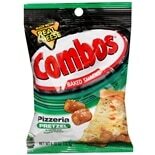 Shop Combos Baked Snacks Pizzeria Pretzel (6.3 oz. )6.3 oz. 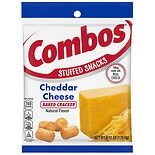 Shop Combos Muddy Buddies Cheddar Cheese Cracker (6.3 oz. )6.3 oz. 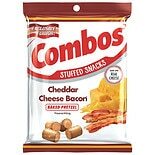 Shop Combos Cheddar Cheese Bacon Baked Pretzel (6 oz. )6 oz. 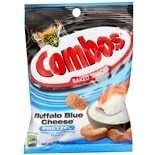 Shop Combos Pretzel Buffalo Blue Cheese (6.3 oz. )6.3 oz. 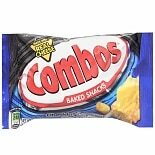 Shop Combos Baked Snacks (1.7 oz. )1.7 oz. 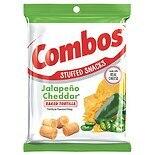 Shop Combos Stuffed Snacks (6.3 oz. )6.3 oz. 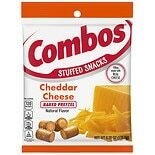 Shop Combos Pretzel Snacks Cheese (1.8 oz. )1.8 oz.